Meet the Beatles for Real: Oh my God -- It IS George! Oh my God -- It IS George! Tonight's story is written by Cindy Noe and was initially found in The Harrison Alliance March/April 1976 issue. We went to the Roxy an hour early, and the line was already down the street. When we finally got in, we sat down where we could, and immediately started scanning the crowd for "familiar" faces. Karen was also looking for a friend of hers from A&M, so she went to ask a likely looking guy who was standing in a doorway. He said he didn't know (had an English accent), so Karen sat down again. Linda A. came in and went to talk to him. It then occurred to Karen that she had just spoken to Terry Doran. We still didn't see George, and we began to feel that we had jumped the gun a bit -- that he wasn't going to show up after all. So we stopped looking. Sue suddenly grabbed my arm and almost crushed it. I jumped and said, "Where?" "Over there at the table just sitting down," she said. "Oh my God! That's HIM!," I said, and I grabbed Karen. She said, "What?" "George -- over there!" I told her, but Karen kept saying, "Where, where?" and when she finally saw where we were pointing she said, "Oh, that's not him." Sue and I looked at each other and said, "Yes it is...." Then Karen looked at his hands, and caught a glimpse of him from the eyes up, and said, "My God. It IS George!" and we all started laughing hysterically and ripping each other apart. The other people at our table didn't know what we were carrying on about, and you should have seen some of the looks we got! We slowly calmed down, but I must say that I never saw three bigger wrecks in my life. Karen really pulled herself together after a few minutes, but Sue and I were absolutely spastic. Both of us were visibly shaking. I think the thing that threw us most was that he looked so totally different from the way he had looked on television a couple of days before. Picture him in 1969 (Hey Jude LP photo), and you've got a good idea of his appearance. His hair was even all the way round, and shoulder length. He also had a mustache and medium-length beard. He was wearing a navy blue fitted jacket with epaulets; we couldn't see the shirt, but he wore cream-colored pants; couldn't see the shoes either, but who looks at his shoes when you can look at his face? We got a good look at him as he was sitting only about 10-15 feet from us. He was with Olivia - who looked lovely, with her hair on top of her head in a bun, wearing a white print Chinese-style quilted jacket and white pants. They were accompanied by Terry, Harry Nilsson, Jim Keltner and a whole troupe of others. The entire group took up about three tables. I was amused at the way that George was very much the center of the group's attention. Every time he spoke, everyone leaned in to listen to him. It was really funny. As I said earlier, Karen had really gotten herself together and turned to me and said, "I'm going to go over to talk to him." I was still in pretty bad shape and said, "what are you gonna say to him?" and she said, "Just hello-- how are you." She was very cool, and I was just amazed, so I said, "If you're going over to him, so am I." Sue said, "If both of you go, I go." We all got up and started to make our way to his table. We were worried about bugging him, but we never got the chance. A guy standing by his table said to us, "He doesn't want to be bothered," and Karen said, "Can't we just say hi?" and the guy said, "He doesn't want to be bothered," again as we watched some people getting George's autograph. He was very nice to them, and I'm sure he wouldn't have been bothered by three cheerful "hellos!" but we could appreciate what the guy was trying to do, so we went back to our seats. At least we got to stand very near him. Just then a whole bunch of people recognized George, and we were worried that he might feel harassed and go backstage, but the people were cool and decided to leave him alone after all. Shortly thereafter the lights went down, and the show started. It goes without saying that Ravi was magnificent, but I daresay that George gave us quite a magnificent performance himself. We all know how he loved the music. He was really getting into all through the show... quite loudly. He was so cute! He'd be quietly listening to Ravi and just bobbing his and all, then you'd hear a light tapping on the table, getting progressively louder until he was hitting the table with his hands so loudly the people in the audience started turning around to find out where all the racket was coming from. 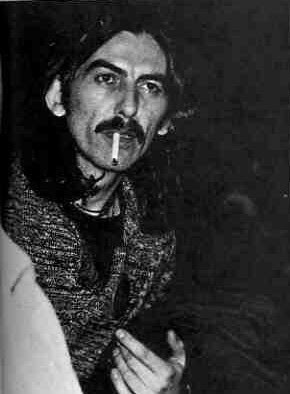 George would stop, realizing that he was making all the noise so it would be very silent again. But a few minutes later you'd hear him back at it again, slapping his thighs, clapping his hands, stomping his feet; every time it was the same thing. He's clap or stomp loudly by mistake, realize how loud he was being, and then quiet down...but only until he had forgotten himself again and become engulfed in the music. Every now and then Ravi and Alla would play something that was particularly extraordinary, that really struck Geoge, and he's laugh so loud that he'd attract attention to himself again, or he'd just make some sound of ecstatic delight, you know? All through the show he clapped and stomped and intermittently let out a whoop or a laugh. He was so incredibly enthusiastic. Ravi even had to shush the crowd a couple of times. Still the peopel around Karen, Sue and I didn't know who it was, and just couldn't figure out why we were freaking out so much. Really funny! George also talked a lot. Mostly in between numbers, but also during them. He used his hands a lot to express himself, as everyone listened intently. So here was George laughing and stomping and just having a wonderful time and it was so beautiful to see someone so expressive and full of life. Of course, we watched him a lot but that is not to take anything away from Ravi's performance, which of course, inspired all the rasa in George. The Indians have an expression, "Nada Brahma" which means "sound is God," and to hear Ravi play is to really experience what that means. Naturally, this audience had come exclusively to hear Ravi, so they were very, very warm and appreciative. I could think of no better setting I'd rather see George up in it, than to be in a small, warm surrounding, with incense burning, and Ravi and Alla playing. It was such a lovely experience for all of us. After the show was over, we rather expected George and company to cut out quickly, but we stayed in our seats and watched patiently as he sat there talking to his friends. People were leaving and he was getting by relatively unnoticed for a while, so we went back to his table to try to say "hello" again, but he was talking so we stood and waited for an opportune moment to speak when he was suddenly mobbed. He got up to leave with all the folks with him following suit. We were still standing by his table as he walked away; he turned around once to look out at everybody. He spotted Karen in her F.P.S.H.O.T. shirt, stopped dead in his tracks, opened his eyes and mouth wide in surprise and pointed directly at her! Of course, everyone else looked too. Karen opened up her jacket to show him the shirt better, and he said to her, "Did you send them?" in the most beautiful, Liverpool accent you've ever heard. We were just knocked over. She said, "No, a friend of mine made them," and he did a very animated, "Ohhh!" and nodded and then walked up the stairs to the private room above the Roxy with friends. I wish you could have seen his expression - the way he said: "Did you send them?" He was darling. 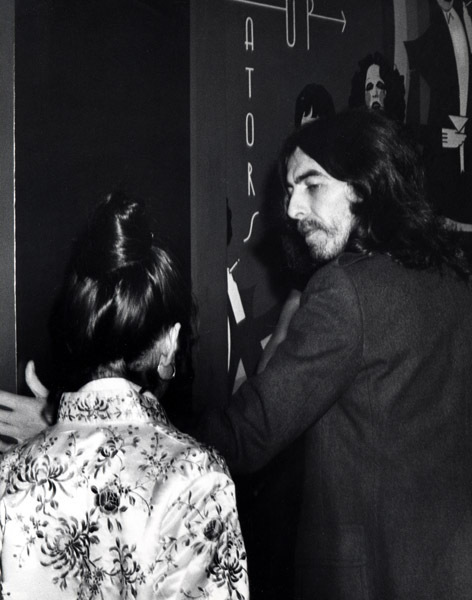 Karen was staggering around saying, "George Harrison just spoke to me," and Sue and I were jumping around her because we were all so amazed that he had acknowledged any of our presences without, you know, our speaking to him first. We afterward went outside to wait for him. We just wanted to see him one more time before we left. It seemed to have gotten around that George Harrison was in our presence, to all those who hadn't known it before, and more than half the audience waited outside too, for about an hour, before they began to filter off. Nevertheless, a very large crowd remained well over two hours to see him. We hung around the back doors while everyone else stood at the front door. At one point a cop car pulled up by us, in hopes of nailing us for curfew, and they kept nagging us about who we were waiting for. I guess we looked too clean cut to be groupies, and they couldn't figure out what we were doing hanging around the back doors of the Roxy so late at night. When we finally told them we were waiting for George Harrison, they didn't know who he was. They said, "What group is he with?" and we kept saying, "He's not with a group." We eventually said that he used to be with The Beatles if they could remember them. Then they started going, "Oh yeah!" and tried to name them all; then they left. Out of about 13 people left waiting after some three hours or so, it was apparent that Karen, Sue and I were the only ones who were actually George Harrison freaks. The rest were just out ot get the big signature and a picutre of a big rock star, so it were, and we were gettinga annoyed at their hanging around so long. There was actually a man and couple of women (older poeple, in fact, in their 40's) who had the audacity to bring some old Beatle magazies and the "Illustrated Record" book with them for George to sign or an old picture of him. We were just appalled at their mindlessness! A young girl and her mother waited around saying things like, "When he comes out you grab his legs and I'll grab his arms. We'll get him! I'm gonna cut off a piece of his hair." Ravi left after abotu 2 1/2 hours and the lady managed to nab him - he was gracious enough to sign a photo of himself from an old Beatle mag. As I said, we were really irritated at their thoughtless behavior. We were the only ones who knew anything about George. Some teeny-boppers hanging around couldn't be old enough to even remember back to 1964. Fortunately, they left. I mean, it was cold and besides a few brief flurries of excitement (Pete Townshed and John Entwistle departed the Rainbow bar next door at about 3:00 -- Liza Minelli went into the Roxy at about 2:30), it was getting a little ridiculous for us to be waiting out there, but we did. That one particularly obnoxious lady came up with what she termed a "brilliant idea" which she told us was to honk the horn of the convertible in front of us to bring George down. We all looked disgusted and Karen said, "You'd better not do that, lady. He wouldn't like that." She just looked insulted and said, "Why not?" We all proceeded to explain to her that he'd rather not be disturbed, and he definitely wouldn't come down if he thought there was a group of people down there waiting to jump him. He very definitely wouldn't take kindly to everybody sitting on his car. We weren't very pleasant, I'm afraid, but she wasn't very smart. Some guy kept asking us if we knew him. We said not personally but he had spoken to us and we did in a round-about way, anyway. We could hear Olivia upstairs talking about someone being ill; she kept mentioning aspirin or Pepto Bismol or something. I sure hope she wasn't referring to Geroge! We were right under the window; everyone else was moving in on us, as I said, and some guy must have heard us mention Olivia's name because he said, "Who's Olivia?" and asked if we heard a voice up there. We said Olivia is George’s lady and no, we didn’t hear anything. Some other lady said, “Whatever happened to Pattie?” I just couldn’t believe that people who knew nothing about him would wait four hours for him in the cold. Oh well. Anyway, but six o’clock in the morning we were all dead from exhaustion and Karen and I had to drive back to San Diego, supposedly before her work and my school that day, and people were just going into the Roxy now. No sign of anyone coming out! He was just having a nice party upstairs (they played a lot of Rod Stewart). So we made loud leaving noises and walked in front of the left-over people making it quite clear that it was no use waiting any longer, that the party was just starting. We never heard when he eventually did come out into the daylight again, but I seriously hope those jerks weren’t still waiting when he did. I cringe at the thought. I went to high school with Cindy and Sue (they were a year ahead of me, but Beatle People have a way of finding one another), but I'd never read this. I did get to hear the story of when Cindy actually talked to George at a Grand Prix event, but that was later.